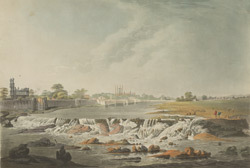 This is plate 1 from 'Hindoostan Scenery consisting of Twelve Select Views in India' by Francis Jukes (1746-1812) and Thomas Anburey (1759-1840) of the Corps of Engineers, Bengal. While serving with the Bengal Army between 1792 and 1793, Anburey helped survey a route from Seringapatam to Hyderabad and on through Berar to Kalpi between. After the rigours of the march through the Nallamalais Range, the city of Hyderabad must have been a welcome sight, with the wide Musi river and elegant mosques and palaces in the background.